Rogier Vandeweghe established himself as an independent potter in Sint Andries, near Bruges, after leaving the ceramic workshop Per Ignem, which he had founded with his brother Laurent in 1947. Under the name Amphora, from 1960 on his quickly expanding workshop produced entirely hand-thrown vessels. His modern forms – with glazes developed in-house and experimental firing techniques – rapidly earned the workshop an international reputation. Participation in major contemporary exhibitions led to numerous awards and acquisitions by leading ceramic museums across Europe. In 1975 all production ceased, and the workshop faded into obscurity. 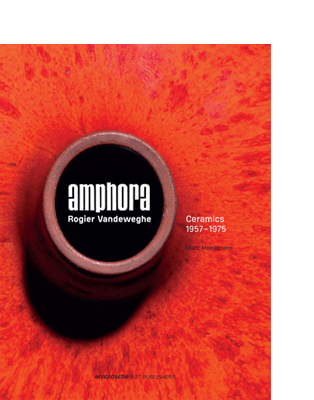 The present publication is a tribute to Rogier Vandeweghe and his wife,Myranna Pyck, for their unwavering commitment and their continuous quest for high-quality modern beauty in their ceramics. MARC HEIREMANS is a renowned expert on Murano glass and ceramics. He is a member of the Royal Chamber of Antiquarians of Belgium and of the Belgium Chamber of Art Experts. Heiremans is also author of various Arnoldsche publications on Murano Glass and the volume Art Ceramics. Pioneers in Flanders 1938–1978.